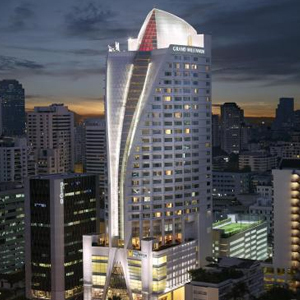 Located near the Asoke intersection, The Grand Millennium Sukhumvit is a convenient hotel in Bangkok's business sector. The hotel has several restaurants, a jazz bar on the first floor, and a well equipped spa for in-city pampering. FlourWorx bistro on the first floor serves good tea and sandwiches, and is a popular take-out spot for office workers in the area. From Asoke BTS Station, turn into Asoke, Grand Millennium Sukhumvitt will be on your right. Alternatively, enter through Sukhumvit soi 23, the back entrance to Grand Millennium will be on your left.